An internal inspection is absolutely essential to fully appreciate this four bedroom house situated in a popular estate Brufut Gardens (Taf). 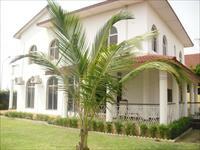 The property comprises a specious lounge, dining room, fitted kitchen, all rooms are en-suite. It also have a garage, a nice well maintain garden and a bantaba.